We’d love your help. Let us know what’s wrong with this preview of Seoul Man by Frank Ahrens. When Frank Ahrens, a middle-aged bachelor and eighteen-year veteran at the Washington Post, fell in love with a diplomat, his life changed dramatically. Follow Recounting his three years in Korea, the highest-ranking non-Korean executive at Hyundai sheds light on a business culture very few Western journalists ever experience in this revealing, moving, and hilarious memoir. For the next three years, Frank traveled to auto shows and press conferences around the world, pitching Hyundai to former colleagues while trying to navigate cultural differences at home and at work. While his appreciation for absurdity enabled him to laugh his way through many awkward encounters, his job began to take a toll on his marriage and family. Eventually, he became a vice president—the highest-ranking non-Korean in the history of Hyundai—but at an untenable price. To ask other readers questions about Seoul Man, please sign up. First and foremost, this is a pop-business book, and as such it's quite good. I learned plenty about the automotive industry, its PR environment, and Korean corporate culture, as well as the adjustment a journalist had to make moving into PR, but it's all lightweight stuff as the genre demands. The rest is where it fell down for me. There could have been more incisive general Korean cultural observations -- I'd be shocked if Ahrens doesn't have them -- but neither the business book framing nor Ah First and foremost, this is a pop-business book, and as such it's quite good. I learned plenty about the automotive industry, its PR environment, and Korean corporate culture, as well as the adjustment a journalist had to make moving into PR, but it's all lightweight stuff as the genre demands. Pierwsza połowa książki? 3, a nawet 4 gwiazdki. Ciekawe anegdoty, spora garść rzetelnych, merytorycznych uwag. Ostatnie 100 stron? Memoir nadętego bufona wartościującego obcą sobie kulturę. Autor z upodobaniem rozwodził się na temat swojej wiary- momentami poświęcając bogu i swoim modlitwom kilka stron tekstu. W książce zatytułowanej "Koreańczycy. W pułapce doskonałości". To i wiele więcej tego typu "smaczków" sprawiły, że z zimną satysfakcją daję temu "dziełu" jedną gwiazdkę. Trochę pokory. nie Pierwsza połowa książki? 3, a nawet 4 gwiazdki. Ciekawe anegdoty, spora garść rzetelnych, merytorycznych uwag. Very readable expat view of life in South Korea and in the corporate world of Hyundai. Learned a little about history, N/S Korea relations, politics, culture and quirks. The first 200+ pages of “Seoul Man” by Frank Ahrens are very informative. They provide wealth of information about the business culture in Korea (especially at Hyundai’s headquarter, where Frank worked for three years). The last 100 or so pages are about fatherhood and the author’s family affairs, which I thought were irrelevant. Overall, a big chunk of this book is about the impact of living overseas on ones marriage and family life. Some, like me, will find this distracting, while other, espec The first 200+ pages of “Seoul Man” by Frank Ahrens are very informative. They provide wealth of information about the business culture in Korea (especially at Hyundai’s headquarter, where Frank worked for three years). The last 100 or so pages are about fatherhood and the author’s family affairs, which I thought were irrelevant. Overall, a big chunk of this book is about the impact of living overseas on ones marriage and family life. Some, like me, will find this distracting, while other, especially those interested in parenthood, will find it appealing. It would make it easier to review this book by comparing it to another from the same genre. Recently I finished reading “Dispatches from the peninsula” By Chris Tharp. Both “Dispatches” and “Seoul Man” are memoirs by “older” American expats about their work and life experiences in Korea. “Dispatches” is a typical memoir or Travelogue by an expat English teacher where you will find plenty of references about students and their parents. The major differences between the two authors is that Chris lived among Koreans, had a Korean girlfriend, and enjoyed Korean food. He truly loved his experience and provided valuable insights about his travels throughout Korea. Frank, on the other hand, worked at a major corporation where he primarily interacted with adults. He had an American wife, lived on the American base in Seoul, disliked Korean food, and for most part, did not seem to comprehend and/or appreciate Korean culture. His book is primarily about his work experience since he did not seem to bother discovering what Korea had to offer. To him, almost anything that Koreans did that was different from how it is done in the west is awkward or nonsensical (at least that’s what his writing conveyed to me). I am not sure why the book was titled "Seoul Man". There is barely any discussion of Seoul. The author spent most of his time between work and home. A more fitting title would have been "Hyundai's Man in Seoul". Besides, i did not find anything unexpectedly hilarious in this book. It was mostly presented in a serious scholastic tone. A casual tourist or a young reader who is contemplating a teaching gig in Asia will probably enjoy “Dispatches” more. An older or a serious reader who is contemplating a move to Asia to pursue a professional, non-teaching job, will find Frank’s book invaluable as it provides insights into the mind of professionals and the work culture in corporate Korea. Car enthusiasts will also enjoy “Seoul Man” where they will find numerous references to Hyundai’s history and cars. This book changed my opinion about Korean cars. Although I may disagree with Frank's worldviews, it is apparent that he is a talented PR man. Belonging to the same group of limited group of foreigners still working at the same firm as Frank, I must say that there are both positives as well as stark negatives of this book. First of all, it's a personal memoir and not a crash course on either Korean culture or the working culture of the firm he worked at. With highly limited involvement in the day to day workings of the company, which is not clearly expressed in the book, his experiences reflect a narrow or more biased approach of the t Belonging to the same group of limited group of foreigners still working at the same firm as Frank, I must say that there are both positives as well as stark negatives of this book. First of all, it's a personal memoir and not a crash course on either Korean culture or the working culture of the firm he worked at. With highly limited involvement in the day to day workings of the company, which is not clearly expressed in the book, his experiences reflect a narrow or more biased approach of the true reality. Though, most of his observations are true and factual in nature. Secondly, his remarks in Korea in general were partially blinded by his remarkable isolation from the country and the culture itself. Living in the US base while attending the military ration store hardly counts as a meaningful experience of a new country. His limited interaction with the country hides some of the deeper and more interesting facts for which Korea is very well known for. And last but not the least, half of the book is about his relationship with his wife and kids. Though set up in Korea, the memoir blatantly shifts focus towards personal issues, marginally affected by the location, but starkly separated from the main focus of the book. I'm always a touch hesitant to plaster on that fifth star with the "amazing" label - it seems as though only a VERY limited number of listens ought to make it to that level. But to say I "really liked it" would be almost as wrong. The "Seoul Man" title seems intended to catch the eye, as the story is really Ahrens' memoir, which I suspect he may someday wish to extend with a similar story of some later years. Seoul holds the story together, but it is not limited to only that. One will learn a fai I'm always a touch hesitant to plaster on that fifth star with the "amazing" label - it seems as though only a VERY limited number of listens ought to make it to that level. But to say I "really liked it" would be almost as wrong. Frank Ahrens’ Seoul Man is the story of an American newspaperman’s three year stint in public relations at Hyundai Motor corporation in Seoul, South Korea. It’s also a story about change: a forty-something bachelor’s plunge into married life, when his bride suddenly falls from the sky. She "fell out of the sky", Ahrens writes, “but missed my lap." The changes continue, as Ahrens transitions from his job at the newspaper to a new post halfway around the world. From the start, Ahrens finds himself Frank Ahrens’ Seoul Man is the story of an American newspaperman’s three year stint in public relations at Hyundai Motor corporation in Seoul, South Korea. It’s also a story about change: a forty-something bachelor’s plunge into married life, when his bride suddenly falls from the sky. She "fell out of the sky", Ahrens writes, “but missed my lap." The changes continue, as Ahrens transitions from his job at the newspaper to a new post halfway around the world. From the start, Ahrens finds himself out of his element in Korea, pressured by his corporate buddies into participating in their ritual drinking and karaoke, or noraebang, culture. Ahrens remains an "America bomb" (the nickname given to him by his wife) for much of the book, stepping on toes at the office while gradually learning some of the differences between American and Korean cultures. Most nights he retreats to his bubble on a U.S. military base in Yongsan. От ви, скажімо, знали, що жителі Південної Кореї - нація №1 по споживанню алкоголю? Що вони одержимі пластичними операціями? Що замість борщу в них - квашена капуста «кімчі», а замість самогонки - рисова горілка «соджу»? Що в сусідньому КНДР - марихуана легальна і не класифікується як наркотик? Що там надворі не 2018-ий, а 107-ий? Що там є 28 утверджених Кім Чен Іном зачісок і тільки їх можна юзати? Що за носіння джинсів - в'язниця, а читання Біблії - страта? Ось і я не знала. Аж поки мені не розп От ви, скажімо, знали, що жителі Південної Кореї - нація №1 по споживанню алкоголю? Що вони одержимі пластичними операціями? Що замість борщу в них - квашена капуста «кімчі», а замість самогонки - рисова горілка «соджу»? 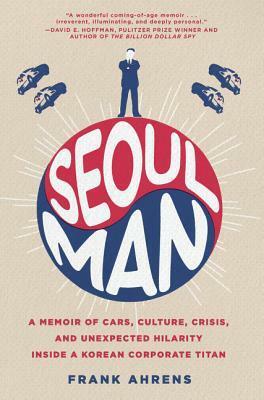 Polski tytuł nie do końca oddaje charakter publikacji, oryginalny sprawia się pod tym względem znacznie lepiej: Seoul Man: A Memoir of Cars, Culture, Crisis, and Unexpected Hilarity Inside a Korean Corporate Titan. Natomiast polski podtytuł W pułapce doskonałości wydaje się nie do końca pasować i może też wprowadzać potencjalnego czytelnika w pewien błąd. Niemniej, książka zdecydowanie warta jest uwagi. Pokazuje świat z naszego punktu widzenia egzotyczny i nieznany. Miłośnicy literatury fakty na Polski tytuł nie do końca oddaje charakter publikacji, oryginalny sprawia się pod tym względem znacznie lepiej: Seoul Man: A Memoir of Cars, Culture, Crisis, and Unexpected Hilarity Inside a Korean Corporate Titan. Natomiast polski podtytuł W pułapce doskonałości wydaje się nie do końca pasować i może też wprowadzać potencjalnego czytelnika w pewien błąd. Niemniej, książka zdecydowanie warta jest uwagi. Pokazuje świat z naszego punktu widzenia egzotyczny i nieznany. Miłośnicy literatury fakty na pewno nie będą rozczarowani! This book was so much more interesting and engaging than I expected. It touched on the behind the scenes perspective of working at Hyundai during a pivotal time, the expat life in Korea and Jakarta, introduced me to a lot of Korean history and culture I should already know, but appreciated differently from the perspective of a fish-out-of-water American, and even layered in the surprising layer of faith and how that played a role through it all. Surprisingly one of my favorite reads of the year. Excellent book on Korean corporate life. I was pleasantly surprised at how accurately it was described - including the surrounding society and historical context. I would recommend this book to all foreigners looking for corporate life in Korea. Korean corporate life, especially at the executive level, is tough, just like in US fortune 500 companies. For foreigners, times that by 3 or more (adding language, cultural shock...). I enjoyed the story about Korean culture and Hyundai, and that's what I thought the book was about, but then he started talking too much about himself and his family, which was not what I expected to read. I also dislike that he talked about Asian politics in an overly simplistic manner and how he was going to lift Indonesians out of poverty by giving them a job. The author means well, but he should have avoided discussing sensitive and irrelevant matters if they are not the book's focus. An intriguing book that looks at Korean corporate culture, loses a bit of steam at the end as the author talked about more personal stuff, I guess I should care about that . Maybe not. Anyways the book moves at a good pace and provides insight as to how cultural differences in the workplace can potentially lead to conflict without either side knowing it. This is a well written memoir. I enjoyed learning a bit more about Korean culture from an American perspective. Sometimes it had too much about Hyundai - car fans may enjoy this much detail and the company and how cars are made and I enjoyed some but sometimes it was overkill. I was more interested in working with people aspects of this book and those were good. Хороша книга, трішки про Корею, трішки про Хюндай, трішки про адаптацію до культури, трішки більше про сімейні проблеми. Сподіваюсь, що до цього часу все склалось більш оптимістично, ніж на час завершення книги. Very entertaining account of an American hired as an executive in S. Korea. What he experienced is very telling of Korean culture. It also has an insightful explanation of underlying attitude and commonly understood beliefs of Koreans. Thoroughly enjoyed it. This book was rather light on "unexpected hilarity," but I found it an extremely interesting perspective on auto manufacturing and Korean culture. If that sounds boring, it was written in a narrative style that made it not so -- at least to me. I really enjoyed the book. The informative book with the real meaning of life. Author described cultural features, historical background and which influence it had on him. How did this book make me feel? I was impressed by ambition and thirst for new, as well as the sacrifice his wife. An interesting read on an expat's working stint in a Korean chaebol. Great autobiography book with accents on Hyundai, cars, work, family, relations and priorities. All these coming along author's understanding of Korea. Worth reading. Light but enjoyable. The weird mix of car stuff and ex-pat stuff is probably not going to interest everyone, but I liked it. A frequently funny, entertaining look at an ex-pat's time working for Hyundai in Seoul, Korea. There was a lot I could relate to from my own time living abroad in China. Okay not great. There are some very funny stories, but overall the story is a bit naive about how business is done internationally.